LYON - The link between drought and the rise and fall of Egypt's ancient cultures, including the pyramid builders, has long fascinated scientists and historians. Now, they're looking into an unexpected source to find connections: mummy teeth. (ANSAmed) - CAIRO, JANUARY 10 - Life-long archaeologist Angelo Sesana, now head of the mission carrying out excavations on the western bank of the Nile in Luxor, says with unabashed excitement that ''it moves you like little else to bring back to life someone who sought immortality 4,000 years ago.'' The mission is being conducted by the Centre of Egyptology Francesco Ballerini (CEFB) in the Egyptian city best known for the Valley of the Kings and in the area corresponding to the temple of the Pharaoh Amenhotep II, who reigned during the 18th dynasty (1427-1401 B.C.). 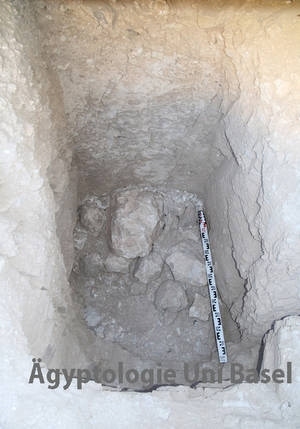 Today the Egyptian Ministry of Antiquities announced that his mission had found a necropolis and a group of canopy vases, in which the mummified innards of the dead were kept. The finds are in perfect condition. The ruins of the 1,500-year-old St. Menas’ church and monastery near Alexandria, Egypt, are sinking into water-saturated soil and may be added to the UN’s list of World Heritage Sites in Danger. The situation worsened two weeks ago with the collapse of an ancient crypt at the site. Called “Abu Mena” ever since it was destroyed around 600 AD during the Islamic Conquest, the church was built around 300 AD in honor of Egyptian martyr St. Menas. A monastery was added and the area became a Christian pilgrimage center. It was designated a World Heritage Site in 1979. The growth of agriculture in what was a desert area has led to a significant rise in the water table – which has caused a number of the site’s buildings to collapse or become unstable. Authorities have placed sand in the bases of several of the buildings that are most endangered. The ruins todaySt. Menas was martyred during the early Roman persecution of the church and, according to tradition, his body was taken from Alexandria on a camel, which was led into the desert. At the current ruins site, the camel refused to continue. This was taken as a divine sign and the martyr was buried there. And God wished to reveal the [place of the] body of Saint Mînâs. And there was in that desert a certain shepherd, and one day a sheep which was suffering from the disease of the scab went to that place, and dipped himself in the water of the little spring which was near the place, and he rolled about in it and was healed straightway. And when the shepherd saw this thing, and understood the miracle, he marvelled exceedingly and was astonished. And afterwards he used to take some of the dust from that shrine, and mix it with water, and rub it on the sheep, and if they were ill with the scab, they were straightway healed thereby. And this he used to do at all times, and he healed all the sick who came to him by this means. Word of the healings spread rapidly. Roman Emperor Constantine is said to have sent his ailing daughter there. She is credited with finding Menas’ bones, after which Constantine ordered the construction of a church at the site. By the late 4th century, the church and monastery were a significant pilgrimage destination for Christians who sought healing and other miracles. During the reign of the Emperor Arcadius, the local archbishop observed that crowds were overwhelming the small church. He wrote to the emperor, who ordered a major expansion of the facilities. The site was first excavated from 1905 to 1907, uncovering a large basilica, an adjacent chapel which had probably housed the saint’s remains and Roman baths. The site is in danger and needs major funds for restoration, says Mohamed Reda, head of Egypt’s Engineering and Technical Unit for the Museums and Monuments in Delta and Sinai at the Supreme Council of Antiquities. The rise in groundwater levels is a common problem in the area. The Supreme Council of Antiquities had allocated over 45 million Egyptian pounds — U.S. $7.5 million – to save the site using a network of water pumps and drainage systems and build a fence around Abu Mena to protect it from encroachments and theft. Work at least 21 other archaeological sites have been put on hold due funding shortages, said explained Reda. “Underground water has risen again by five meters and part of the Abu Mena crypt collapsed two weeks ago,” he said. Other endangered sites include a Jewish temple, the Greco-Roman Museum and the Mosaic Museum. The International Council of Museums (ICOM) today announced that it has released a Red List for Egypt. Red Lists (http://icom.museum/what-we-do/programmes/fighting-illicit-traffic/red-list.html) describe various types of cultural objects that are considered to be at-risk. Such lists have been created for cultural objects from Afghanistan, Cambodia, Africa, and seven other places. "Following several months of preparation, ICOM is delighted to announce the official launch of a new Red List in the coming weeks. The Emergency Red List of Egyptian Cultural Objects at Risk, the 11th publication in ICOM’s Red List series and its third Emergency Red List, is one of the tangible outcomes of ICOM’s involvement in the protection of Egyptian cultural heritage, following the events that shook the country in the past year. The List was drafted in close collaboration with members of ICOM’s International Committee for Egyptology (CIPEG), national and international experts in Egyptian art and antiquities, and the Ministry of Antiquities of Egypt." "The Emergency Red List was made possible thanks to the generous support of the Bureau of Educational and Cultural Affairs of the US Department of State." "The official launch of the Emergency Red List of Egyptian Cultural Objects at Risk will take place at the National Museum of Egyptian Civilisation (NMEC) in Cairo, Egypt, in the presence of ICOM Director General Julien Anfruns, members of the Egyptian government and local heritage institutions, national and international experts, police and customs officials, partners of the project and the media. The event will be followed by an awareness-raising and capacity-building workshop on the Red List series and its worldwide usage in fighting illicit traffic in cultural goods." Czech archaeologists have found a long lost temple from the Meroe period near the town of Vad Bon Naga in Sudan, Pavel Onderka, from Prague's Naprstek Museum of Asian, African and American Cultures, told journalists yesterday. The large temple compound is situated 130 km northwards of Khartoum. European travellers saw the remains of the temple in the early 19th century but then the temple disappeared in the desert, said Onderka who leads the Czech archaeology expedition. He said the Czech expedition revealed a signet ring with a picture of Nubian Lion god Apede-mak, a statuette of the originally Egyptian god Osiris, a stone with a Meroe hieroglyphs and parts of sandstone blocks. Czech archaeologists have been working in the Vad Bon Naga locality for three seasons. In the Meroe Kingdom period, from the 4th century B.C. to the 4th century A.D., the site hosted one of the ancient Nubia's biggest towns, Arabikeleb. Around the turn of the millennium, a big palace and at least five temples were built in the town with 25,000 inhabitants. Czech archaeologists previously uncovered a palace belonging to Queen Amanishakheto, who ruled in the 1st century B.C. In the past season they continued the conservation and restoration works in the palace, which is the best preserved of all Meroe-era palaces. The Sudanese expedition is a continuation of the long tradition of Czech archaeological and etnographic research in the Nile Valley. Apart from conducting research, Czech archaeologists in Sudan have established contacts with local inhabitants. They mediated a partnership between Van Bon Naga and the Czech town of Otrokovice. They also help support local schools. They originally wanted to build a well in Vad Bon Naga but concluded that the plan was unfeasible due to the local geological conditions. As a result, they decided to build waterworks to provide drinking water. The locality lacks drinking water and people use water from the Nile. An international research team in Lisbon has diagnosed the oldest case of prostate cancer in ancient Egypt and the second oldest case in the world. Using high-resolution computerized tomography (CT) scanners, the researchers identified the cancer in a mummy subject known as M1. “Cancer is such a hot topic these days; experts are constantly trying to probe in hopes of answering the one question- when and how did the ailment really evolve?” said Salima Ikram; member of the research team and professor of Egyptology at The American University in Cairo (AUC). The study, published in the International Journal of Paleopathology used CT scans with pixel resolution of 0.33 millimeters on three Egyptian mummies from the collection of the National Archaeological Museum in Lisbon. The images revealed several small, round, dense bone lesions located mainly in M1’s pelvis, spine and proximal limbs, indicative of metastatic prostate cancer. Until recently, researchers have believed the widespread occurrence of carcinogens in food and in the environment were the main causes of cancer in the modern industrial age. Ikram suggested that there are more deaths attributable to cancer today simply because people are living longer. “Life expectancy in ancient Egyptian societies ranged from 30 to 40 years, meaning that those afflicted with the disease were probably dying from reasons other than its progression,” she argued. The earliest detection of prostate cancer in the world came from the 2,700-year-old skeleton of a Scythian king in Russia, leading scientists to suspect that cancer was quite prevalent in the past despite the scarcity of recorded cases. This link will take you a 2 1/2 minute video clip of the newly discovered KV64 tomb. 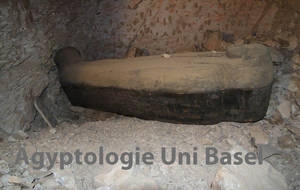 The narration is in German, but even if you do not understand what is being said it provides some good pictures of the tomb, the coffin and the mummy that was found. Ancient Egyptians paid special attention to the organs of their dead, embalming them so they would continue to function in the afterlife. Now it seems they did the same for sacrificed ibis birds, and even packed their stomachs with food so they wouldn't go hungry. Ibis mummies are found in their millions at shrines in Egypt, where they were sacrificed to Thoth, the god of writing and wisdom. 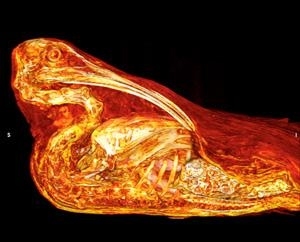 Andrew Wade at the University of Western Ontario in London, Canada, and his colleagues used a CT scanner to look inside two mummified adult ibises and one hatchling. This revealed that embalmers had removed their internal organs. The adult gizzards, complete with snail shells which may have come from the birds' last meals, were then replaced. The hatchling's body cavity had been stuffed with grain. Studies of human mummies show that ancient Egyptians often removed and embalmed the lungs and digestion organs before placing them back inside the body – perhaps so they might work in the afterlife. The ibis mummies suggest Egyptians believed that birds also travelled to the afterlife, says Wade. "It suggests the provision of an afterlife food source to the bird," he says, "and lends support to the idea that the viscera of ibises and humans alike were meant to continue their living function within the afterlife." The Egyptian Revolution that began a year ago continues to create instability in a country rich with antiquity. But most Egyptologists say it’s business as usual, even with the recent return of protestors to Tahrir Square in Cairo. “The impact has been very minor,” said Emily Teeter, an Egyptologist and research associate at the Oriental Institute, a research center and archaeology museum at the University of Chicago. Teeter, also a representative to the Chicago chapter of the American Research Center in Egypt, was in Egypt as recently as last November. “The biggest disruption has been bureaucratic. Permissions were disrupted because committees weren’t meeting. Basically trying to do advanced planning was very hard,” she said. Kathleen Scott, director of publications at the San Antonio chapter of the American Research Center, also reported only minor issues unrelated to safety. With anywhere from 10 to 15 expeditions in Egypt at a time, depending on schedules and seasons, the organization also maintains an office in Cairo. Most archaeological work occurs not in the major cities, but in less populated places such as Luxor, the site of former Egyptian capital Thebes, where the University of Chicago has a permanent headquarters. Although Luxor was undisrupted, various institutions did send home students as a precaution. “The main problems, if any, are in Cairo and Alexandria,” said Janet Johnson, professor of Egyptology at the University of Chicago.